To nominate a fellow club member for runner of the month, just provide the name of your nominee, along with your reasons why you think he/she should win, to the Club Secretary. 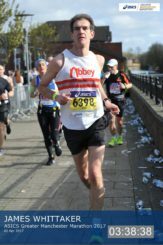 Nomination must be in writing, via e-mail to clubsecretary@abbeyrunners.co.uk or by using this form and must be received before the 1st of the following month. 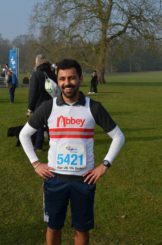 Members may be nominated on the basis of race performances, attitude and commitment to training, or for any other significant contribution to the club’s activities. The only restriction is that no member may win the award more than once during a 12 month period. 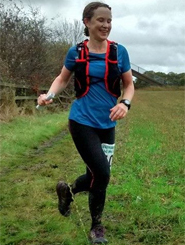 Congratulations to Sarah for being awarded Runner of the Month for March! 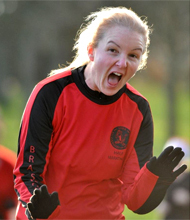 She was nominated for smashing her 10K PB with 44:47 at Bradford. 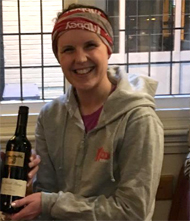 Congratulations to Laura for being awarded Runner of the Month for February! She was nominated for her strong improvement, noticeable at the pecoXCs particularly race 5. 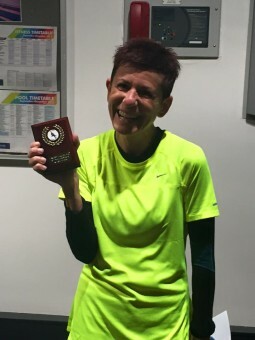 Congratulations to Faye for being awarded Runner of the Month for January! She was nominated for her strong improvement, her performance at PECO Race 4 and her 5k PB of 22.31. 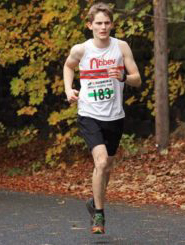 Also nominated was James Roden for his 4th place in the 17k Kirkstall Calverley Cutter and winning his age category! A amazing debut for the club, winning the first PecoXC race at Middleton Park by quite a margin. Nominated for her 3.53 time at the New York Marathon and her commitment to training in he run up to this. She was also 3rd in her age group in the Vale of York Half Marathon. 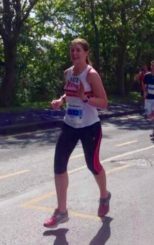 Alison achieved a sub 22 minutes 5K and ran well at the Firefighters 5 mile. Matt ran an impressive 37.53 at the Firefighters 5 mile. Also nominated was Cal Clark for stepping in at the Leeds Country Way at short notice. 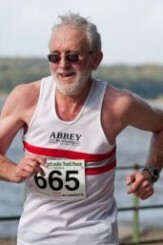 Congratulations to Graeme for being our Runner of the Month for July. Awarded for PBs in 10K and breaking 23 minutes for a 5K. Other nominations were Thomas Hetherington, Kaiden Balkwill, Laura Philips and Lisa Stansbie. Congratulations to Zellany for being our Runner of the Month for June. 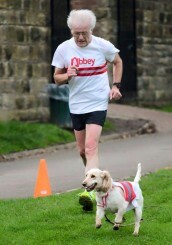 Awarded for coming first in her age category in both the Otley 10 mile and the Pudsey 10K. 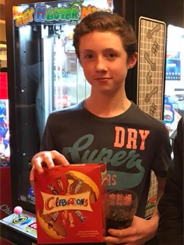 Other nominations were Helen Roden, Ryan Clark & Alex Kilcoyne. Other nominations were Aiden Curley, John Ward, Peter Persico, Helen Roden and James Balkwill. Other nominations were Alison Smith, Adam Ellis, and Michaela Clark (who was not eligible). Well done to our joint RoM for February. Freddie for sub 20 min PB, and Lisa for performance at PECOs and strong return to fitness from maternity leave. 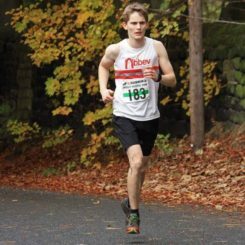 Congratulations to Liam Jenkins for being our Runner of the Month for January. Awarded for his strong (and improving!) 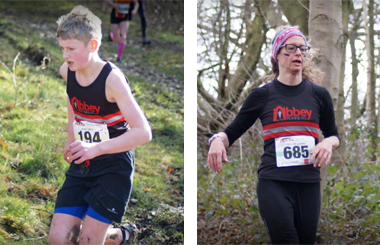 performances in the PECO XC Races. 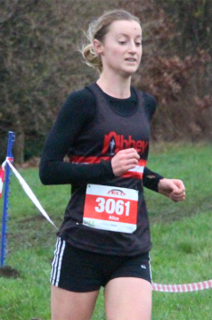 Congratulations to Michaela Clark for being our Runner of the Month for December. 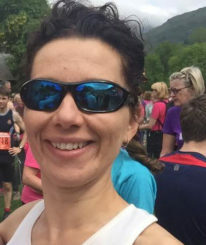 Michaela achieved 3rd in her age category at the Chevin Chase followed by 2nd in her age category a few days later at the Ribble Valley 10k with a PB of 40:46. Well done, Michaela! 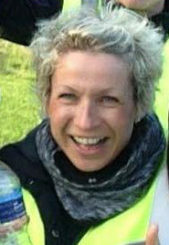 Congratulations to Suzanne Caley for being our Runner of the Month for November. 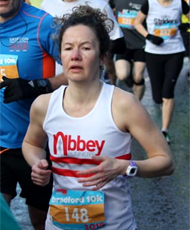 In recognition of her continued progress towards 40 races in her 40th year challenge.In November, she has been wearing the Abbey vest to race in the Abbey Dash, the Bolton Abbey 10m and the Manchester Christmas pudding 5, all done with a big smile and stacks of enthusiasm. 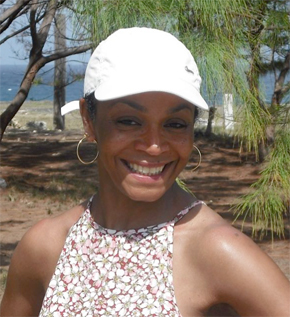 Congratulations to Robin Warden for being our October Runner of the Month! Well done also to our two other most worthy nominees, Zen and Connor Clark. 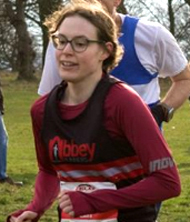 Congratulations to Laura Beesley for being our Runner of the Month for September. Also well done to our other nominees Daisy Nia Moore, Amanda Rhodes and David Beesley. 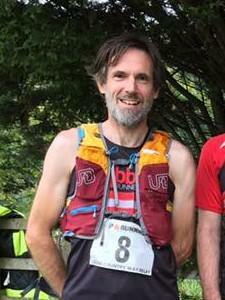 Congratulations to Laurence Lennon for being our Runner of the Month for July! 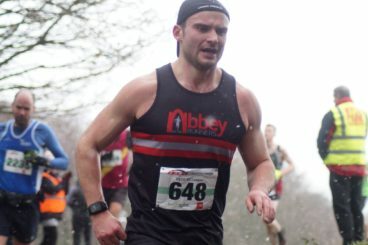 Laurence was nominated for his strong performance at the East Leeds 10k (47 mins! 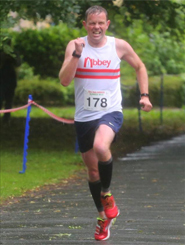 ), excellent recent improvement in pace and race performances generally (inc half marathon PB in May) and overall commitment to the club. 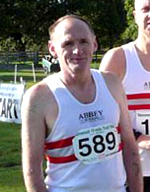 Also nominated for July was Stephen Greene for his time of 39 mins at the Leeds 10k, running in very hot conditions. Plus he did a pretty sterling job again that month as Eccup 10 Race Director! 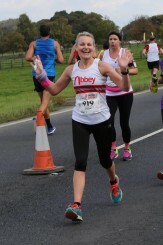 For her 1:47 PB at Leeds Half Marathon as well as a 5K PB at John Carr Race 1. 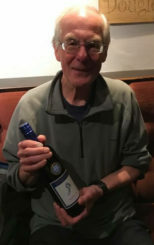 Jim Whittaker: Outstanding performance and P.b. 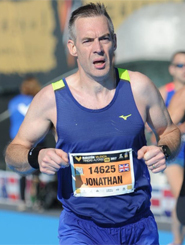 in the Manchester marathon, defying convention and all the rules he achieved this on just a couple of long runs. Well done Jim! 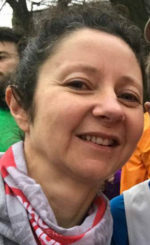 Gill Nesbitt: For her first half marathon in Liverpool, coming in ahead of a 2 hour target in 1:57 and a new 10 mile PB. 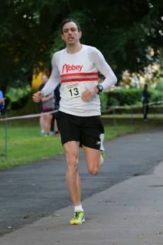 For coming 13th male out of 745 in the PECO individual league and being part of the Abbey Relay team that won the club shield. 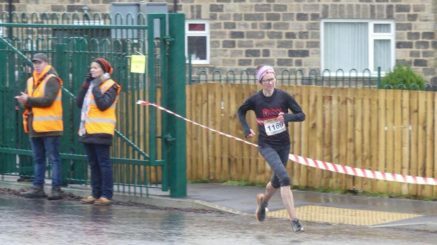 Claire, for her performance at the PECO races and a PB at the Liversedge Half Marathon. 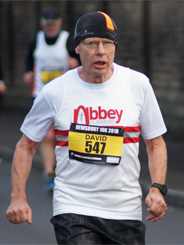 Sunny achieved PB’s for both Dewsbury 10K and Snake Lane 10 mile. For his performances at the Guy Fawkes 10 and the Holly Hustle. 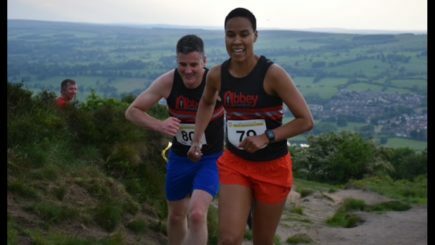 For coming 1st in her age category at the Kirkstall 7.
for coming 3rd in his age category at the West Yorkshire 5 and his strong performances at the YVAA races. for her Race the Stones charity run. 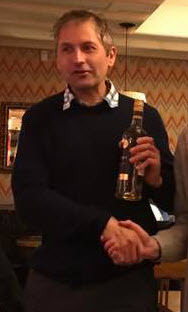 Also nominated was Stephen Greene. Clark for continued commitment to the club and for his contributions whilst recovering – a great example to the rest of us. 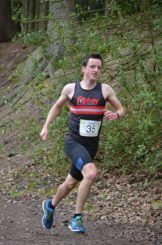 Sam Black for passing 100 parkruns, for first M70 at TNT, for still finding new challenges to motivate himself to get out and run, regular runner at the PECOs and for all round commitment to the club.